k. davis and i have similar names...we're both "k. davis" and that is cool all in itself. she so kindly guest posted for me back in august. 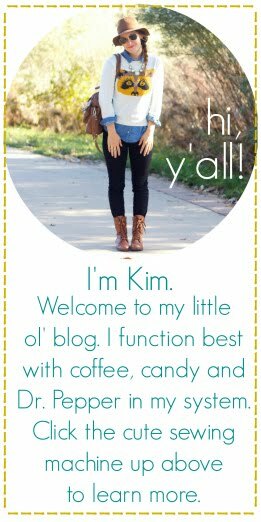 on her blog you will find creativity & wonderful photography. well now i'm here to brag on her etsy shop, in which you will find one of a kind gifts & fun items for yourself. we all like a little gift for ourselves from time to time. no shame. 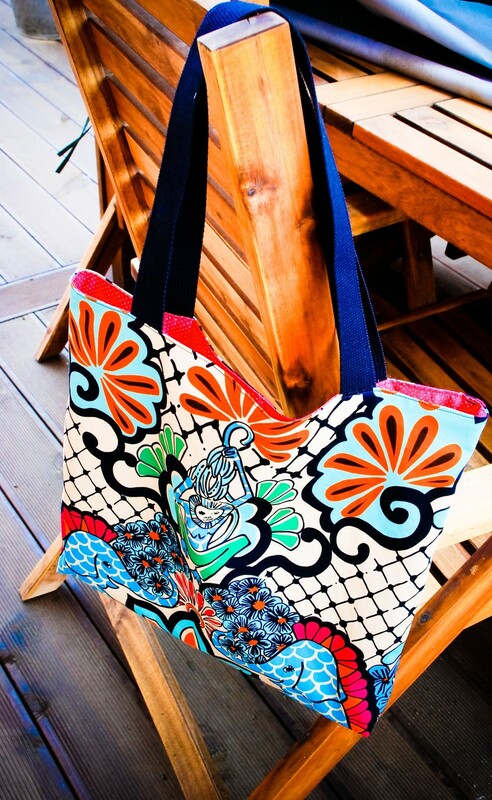 1. head on over to k. davis creates & leave a comment with your favorite item from the shop. love so much the blackbird clutch. 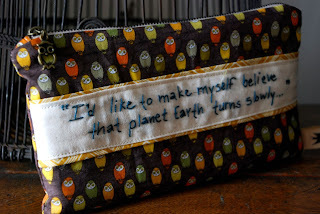 One of my favorite songs and i love the idea of stitching lyrics onto a clutch. I love the owl city lyric clutch, but I did not see it on her site. The small blue flag clutch is pretty cool too. love the Flying High clutches!! One-Of-A-Kindsie Dress- Poppins is perfect and so creative! I want one, even though I don't have a baby and I can't fit into that obviously. I LOVE the Bunting Flag Clutches...so cute! I love the flying High Medium clutch but I also loooove the blackbird clutch drooling!! oh i love k. davis' shop - esp those bunting flag cluthes. those are adorable!!!! girl you KNOW i tweeted. love those bunting clutches. have never seen those before! but most of all i love the little pouch on the phone. i need to win one so that i have the perfect accessory to convince the hubz i need an iphone. i try to convince him to buy me lots of things. CUTE! I like the "Clutch Milan"
Definitely love the Owl City lyric clutch! i like the flying high clutch in yellow! I love the flying high clutch in moss green! I love love love the Set of 4 Mini Notebooks- Poppins! I love the nantucket clutch. I really like her shop - yay for new discoveries! My favorites would have to include the yellow Flying High & Nantucket clutches. I LOVE the black bird clutch!! Those little snap clutches are cute!! love the flying high clutch! 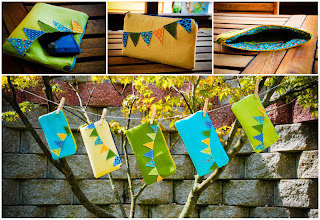 I know this is totally cheesy, but I ADORE that bunting flag clutch (especially in green). So sweet and just my style! you know how much i LOVEEE bunting!! this clutch is sooo adorable!! I love the blackbird clutch! The colors and stitching are so pretty! I think that those bunting clutches are just too cute. I've never seen anything like them!! I love birds!! and I love the Blackbird Clutch! The little saying on the front is just perfect! Yay! Hooray for bunting and felt! Loove those clutches! Her flying high clutch is super cute! Love love love the green bunting wristlet!!! I like the bunting clutches because they make me smile, but the blackbird is awesome too. bunting is my favorite!! how precious!!! and the flying high clutches, of course. I love her Blackbird Clutch! I like the Clutch Milan! I LOVE the blackbird clutch! anything with birds and I am drawn in! The blackbird clutch is great! Sophie will need an "on the go coloring station" sooner than later. Love it! Cute, cute! Love the drawing station in Tweet Tweet - Summer Song is a favorite fabric! i dig the milan clutch. I love the bunting clutches! Adorable! CUTE! I need me a bunting flag clutch! I love the Flying High Clutches! Buntings are the best! love the fabrics she uses on her stuff. that owl print. oy. too cute. the on-the-go drawing stations are too cute! love the moss green clutch! yep. obsessed with the medium flying high green clutch! I <3 the key fobs! 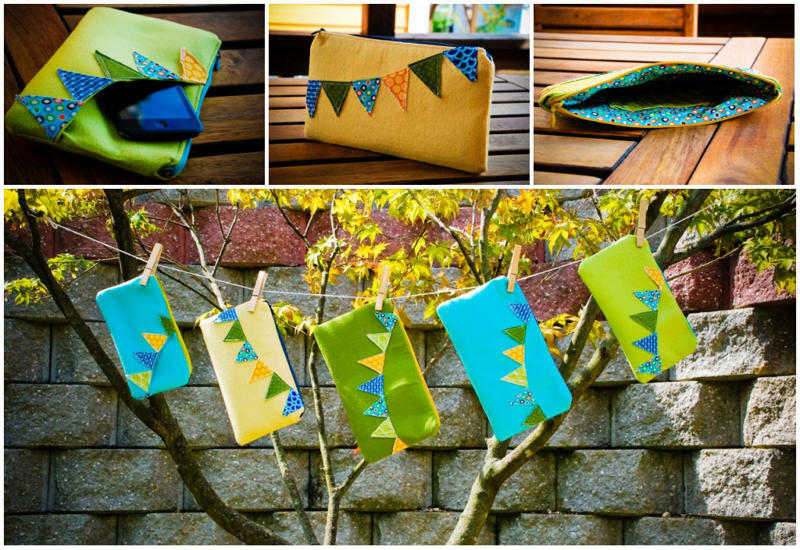 adorable bunting clutches! i'd love a green one! love the pocket on the flag clutch! Love the flying high clutch in yellow! I LOVE the Blackbird Clutch! i think out of every adorable thing she makes. the simple keychains are my favorite! My favorite are the "Feeling Fobulous-small fob keychains"! I'm such a sucker for little baggies/clutches. The apples and pears one is uber cute!